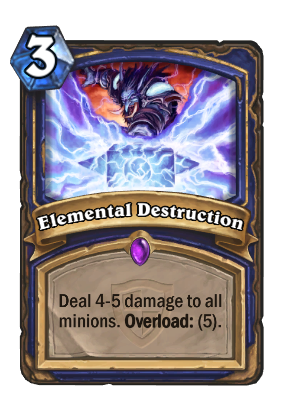 I'm not a shaman or anything, but isn't Elemental Destruction the opposite of what they want to do? Why doesn't this appear when I search for overload? No more that a bad hellfire. 8 manas (3 + 5) to 4/5 dmg in ALL board not good, for that cost double hellfire do 6 Dmg. This is better than double Hellfire for multiple reasons. This is one card. Double Hellfire is two. Having 5 overload is better than paying 5 mana up front. You can play a minion right away to take command of the board. Double Hellfire does 6 damage to both heroes. If your opponent has a board where a global board clear gets value, you're behind enough that 6 damage to your face could kill you or put you in range of a direct damage lethal. Also, it's a Shaman card, not a Warlock card. Shaman doesn't have as many AOE options as Warlock, so having a second AOE might enable some new play. Not to mention they can play around overload as well, while being more likely to boost spell power. Lava Shockcombines great to clear any survivors. Happy Chillwind Yeti: "YES! I survived Elemental Destruction!" So if played on T3, do you go into -5 negative mana on T4, and normal mana on T5? Or overload for 4 on T4, and 1 remaining in T5? Assuming it works like double Dust Devil on turn one, you'd be overloaded for 5 on turn 4. It only overloads the next turn. This looks best as a Malygos Shaman tool, for two reasons. Malygos Shaman already is very, very light on minions to avoid Ancestor's Call bringing out anything but Malygos, so this will hit only your opponent's minions a majority of the time. This card combos with Lava Shock. In Malygos Shaman, Lava Shock can also be used for 7 burst damage, so it can either be used with this card to cancel the overload or with Malygos to kill the opponent. You know you will always deal the minimum, you don't know whether you will deal the maximum. Surprisingly accurate flavor text. Might see play in Malygos shaman, if that's viable. Don't let the overload scare you!!!!!! You can play this turn 5 and lava shock for a turn 6 thaurisson!!!!!! OTK shaman (malygos or windfury combo) is coming back!!!!!!! !